A 57-acre Pima County Natural Preserve and Trails Park that is located in the Tucson Mountain foothills 15 minutes west of downtown. 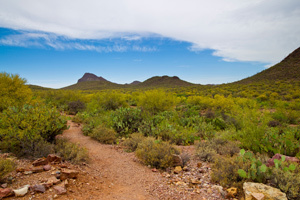 It was developed in 2006 for two main purposes: to protect a beautiful swath of the Sonoran Desert, and to develop trails to enable people with physical challenges to enjoy natural open space. Feliz Paseos has 2 miles of terrific trails that are open to all people on foot or in a wheelchair, disabled or not. The paths are paved (0.2 mile) and natural-surface (1.8 miles). The park has numerous interpretive signs that tell the story of the Sonoran Desert. McKenzie Ranch is a 1,700 acre open space park that has been owned by the county for more than five years. The ranch is on the far east side of Pima County about 1.5 miles north of Marsh Station Road and about 4 miles east of Three Bridges in Pima County’s Cienega Creek Preserve. The address is 12725 S. Red Hill Ranch Road. The McKenzie Ranch Trails Park has several trails on the property; the 3.2 mile Hohokam Trail, which is open to all non-motorized trail users, and the Competitive Mountain Biking Course, which consists of two loops totaling 10 miles. Equestrians are not allowed on the mountain biking competition course, because mountain bikers are riding the course at speed, and it’s not safe to allow both types of users on the course. Runners and hikers can use the course if they travel counter-clockwise (the bikes are riding clockwise), so they can see the bikes coming at them and step out of the way. While the park is available for non-motorized trail use from dawn to dusk 365 days a year, private promoters will put on 4 mountain biking events a year…about one a quarter. 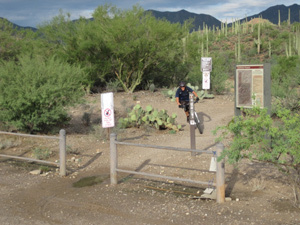 This is the first park that has a competitive mountain bicycling loop in southern Arizona. In comparison, the Phoenix-area has three competitive mountain bicycling courses. 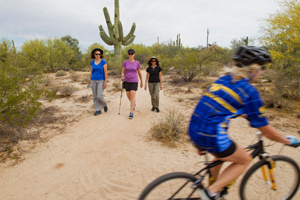 While the genesis of the McKenzie Ranch Trails Park came from staff at the Natural Resources, Parks and Recreation Department, the park was built in partnership with the Sonoran Desert Mountain Bicyclists. Their volunteers were a huge help. Less than 1% of the total park acreage has been developed as a trails park, which means that it remains in excess of 99% natural desert, and Pima County expects it to remain that way. The park property was formerly owned by a large real estate developer, who had planned to build 1,200 homes there, until Pima County received the property. Having a large protected park property like this one usually makes adjacent home values go up, so the park should be a boon to those that live around it. The park will eventually be connected to the Arizona Trail within a few years, and to the rest of the trails around the city of Tucson, making it possible for you to begin your ride or hike on the west side of town and go all the way to McKenzie Ranch (or even farther east). Located near the south end of the Tucson Mountains, this park offers stunning views in all directions from the highest point, and the 16 miles of singletrack trails take mountain bicyclists, hikers, trail runners and equestrians through a Sonoran Desert environment that includes lush vegetation, rock features and a historic house built from native rock. The 1,038-acre Robles Ranch property was added to Tucson Mountain Park in 1999, and trails were completed in 2010. The singletrack includes short loops designed for beginners and hand cycles as well as trails to challenge intermediate and advanced mountain bicyclists. The trails are enjoyed by hikers, trail runners and equestrians, providing a variety of terrain ranging from gentle grades with smooth tracks to steep and rocky sections. This park, located in the foothills of the Tucson Mountains between Sweetwater Road and Camino del Cerro, was purchased with bond funds in 2004. The county purchased an additional 187 acres in 2011, bringing the total acreage to 887. County crews and volunteers have built 15 miles of trails on the park, which was ranked #4 in the nation in Singletracks.com, an online mountain bicycling magazine. While the trails are enjoyed by equestrians, hikers, dog walkers and trail runners, it is highly popular with mountain bikers, both local and visitors. Trails are suitable for beginners and intermediate level riders.